The Internet of Things (IoT) has created new requirements for memory in space- and resource-constrained applications that are adding connectivity where little to none existed before. In particular, the advent of the IoT is driving the use of multichip package (MCP) memory solutions in verticals such as automotive, where the ability to stack non-volatile memory (NVM) and volatile memory (RAM) into a single package is helping reduce footprint, lower ball count, improve performance, and ease design implementation for a range of applications in the connected car. With the development of the IoT impacting everything from industrial to consumer applications and with the resulting explosion of new embedded devices, MCPs are rapidly evolving to meet changing requirements. The ability of machines to connect together and communicate through various wireless protocols is driving growth in a multitude of specific segments such as home security, wearable devices, smart metering, automotive infotainment, and other space-constrained applications where MCPs are well aligned. Initially introduced at the dawn of the cellular phone era, MCPs offer many advantages compared to individual external memory types. MCPs stack NVM —which delivers boot-up of applications, operating system, and other critical code/data execution— with RAM —which serves as high-speed temporary memory— together in one package. In addition to reducing area footprint, providing a lower ball count, and increasing performance and density, MCPs ease design considerations by offloading the embedded memory of a microcontroller (MCU) using industry-standard JEDEC interfaces and memory types. All of these characteristics are driving the adoption of MCPs in IoT applications such as automotive infotainment and active safety systems, which we will examine in more detail. IoT is now reaching into automobiles, with the integration of smartphone-like functionality that enables users to stream music, make restaurant reservations, and purchase movie tickets from the comfort of the car. As a result, in-vehicle memory requirements are growing, with a large contributor in the connected car being the communications modules contained in infotainment systems that enable users to be connected at all times, when they're on the go. 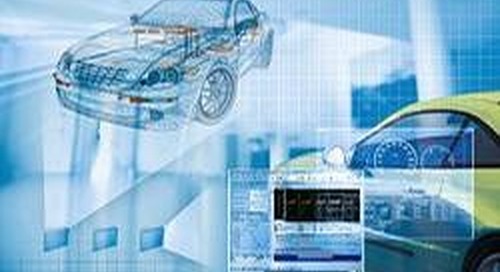 In order to meet these requirements, IoT implementation in automotive applications necessitates memory configurations with the right mix of density, power, size, performance, temperature, reliability, cost, and support. MCPs have the ability to support in-vehicle infotainment and active safety systems while greatly reducing the memory footprint. To meet the memory density and small form factor needs of next-generation automotive applications, automakers are using MCPs with proven process nodes and design stability. Infotainment systems have expanded to include managing and playing audio and video content; utilizing navigation for driving; delivering rear-seat entertainment such as movies, games, social networking, etc. ; listening to incoming and sending outgoing SMS text messages; making phone calls; and accessing Internet-enabled or smartphone-enabled content such as traffic conditions, sports scores and weather forecasts. Future systems look to make infotainment systems the center point of the vehicle with additional features like 3D maps. These infotainment systems need a connection to the Internet, which is provided by 2.5G, 3G, and 4G connectivity modules that are located in a space-constrained area of the automobile, with small, thin modules that are sometimes the size of a postage stamp. NAND MCPs utilize densities ranging from 1Gb to 8Gb to meet the different memory requirements of infotainment systems. In particular, SLC NAND Flash provides better data retention and program/erase (P/E) cycles over temperature compared to other forms of NAND Flash to meet the need for high reliability in harsh temperature environments. Another fast-growing automotive subsegment is advanced driver assistance systems (ADAS). These systems are expanding from detection-only backup sonar beeping to include systems that help keep vehicle occupants safe as well. As the complexity of these systems grows, so do the memory requirements, which is complicated by ADAS modules (like the connectivity modules) having to fit into space-constrained areas of the vehicle. In order for the electronics in the car to keep up with the functionality being added to ADAS for tasks such as collision avoidance, lane detection, obstruction recognition, and other critical functions, manufacturers are looking to MCP memory solutions. For critically fast response time, many existing sensor modules that employ high-performance and high-density LPDDR are moving to more centralized NOR + LPDDR2/LPDDR4 solutions to align with complexity, intelligence, and density requirements. Traditional parallel NOR MCPs utilize densities ranging from 32Mb to 512Mb + PSRAM (pseudo SRAM) or LPDDR and offer high-performance synchronous burst mode to deliver fast boot-up of applications, operating system, and other critical code/data execution through an execute-in-place (XiP) system design that enables burst read speeds of 133 MB/s to 266 MB/s. LPDRAM densities in MCPs range from 512Mb to 8Gb LPDDR and LPDDR2 to boost performance in MCPs from 800 MB/s for a x16 bus width LPDDR clocked at 200 MHz to more than 4 GB/s for the faster x32 bus width LPDDR2 clocked at 533 MHz. All of this performance is packed into the MCP with high-frequency signal integrity using the traditional multi-bus interface MCP design. While MCPs have been below the radar for some time, mainly being used for cellular phones, their evolutionary features and functionality have set the stage for their use in many new IoT applications within the embedded market, especially in the automotive industry. Micron's automotive MCP offerings, available in several densities of NAND + LPDDR or NOR + RAM, meet the low defects per million (DPM) and longevity requirements of the automotive industry without altering board or module requirements. While existing MCP memory solutions already meet the demands of tomorrow's automotive memory subsystems, their performance and density continue to increase while size and power consumption per bit continue to decrease to pave the way for not only next-generation infotainment and ADAS requirements, but also vehicle-to-vehicle (V2V) and vehicle-to-infrastructure (V2I) automotive systems. There's little need to design new technologies or enable complete ecosystems that satisfy IoT and automotive memory requirements because they exist now and are already on the evolutionary highway. MCPs place system designers in the fast lane with easy-to-integrate solutions for applications such as state-of-the-art ADAS and infotainment systems that require high-performance, high-density memory in a small package. With over 20 years in the electronics industry, James Malatesta has held technical and marketing positions at Intel, Numonyx, and Micron. His primary focus has been application engineering, new technology enabling, and product/technical marketing within the memory technology segment.